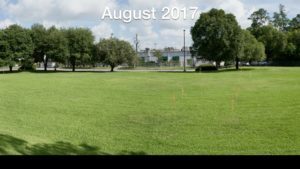 In August of 2017, the Woods High School property was a green meadow. At the writing (August 2018) the Bobbitt Lane site is the home of the new two story high school and gymnasium. The new structure is now “weathered in” and interior finishing is underway. Construction crews are on the site daily routing the HVAC, completing the external brick work, installing windows, and many other tasks. The Steel is Up ! The steel structure of the new high school building has been completed. Build out of the interior will be taking place over the summer.